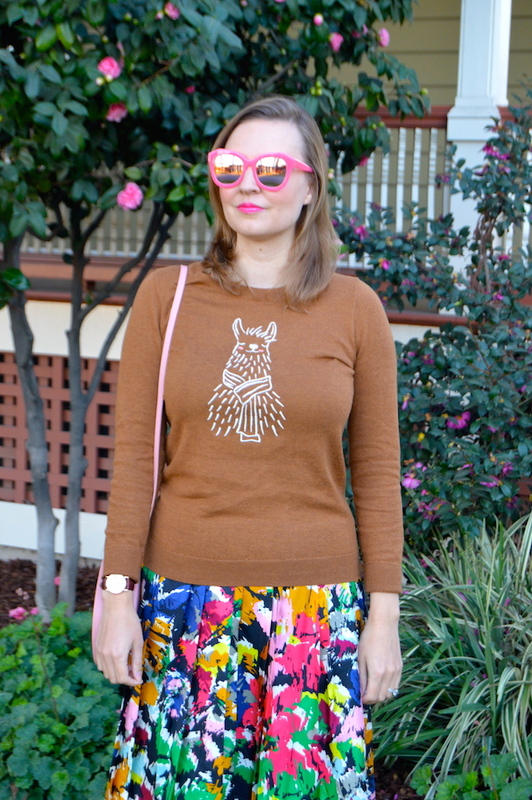 One of my most popular posts from this summer featured a llama T-shirt. This just proved the point I was trying to make in the post, which was that llamas would be the hot animal for the year! (Llamas, they're so hot right now!) 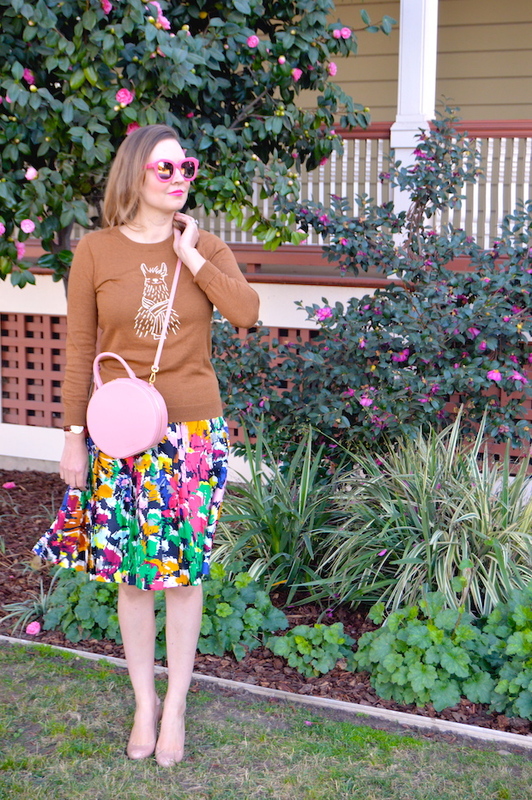 Well, I am back at it again with another llama themed article of clothing! This time, it's in the form of a llama sweater from J. Crew Factory. I actually happened upon this sweater by accident when I went in to the store to return something. On that weekend, the promo was offering all "Tippi" sweaters for $29.55. This was the last llama sweater left on the shelf and I fell in love with it! (I mean, it's a llama wearing a scarf!). Plus, it was my size, so I knew it was meant to be! 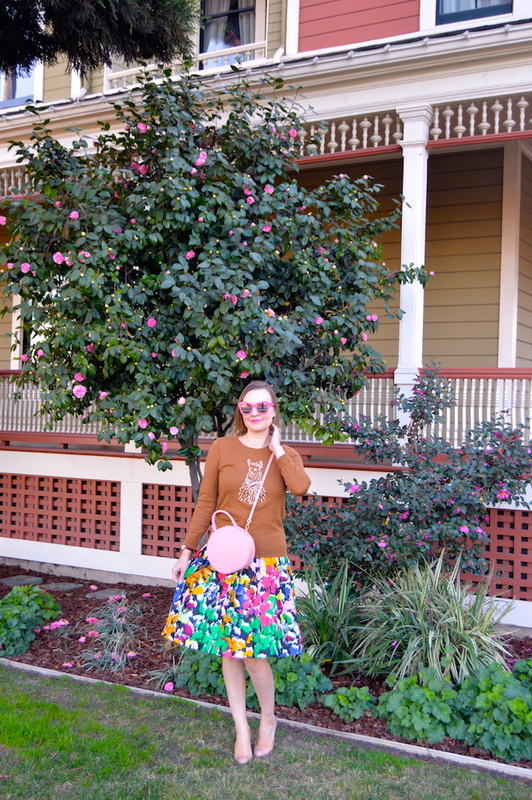 In this post, I am also wearing some of my Christmas presents for this year! Yes, I realize that it's not yet Christmas, but I got them early! 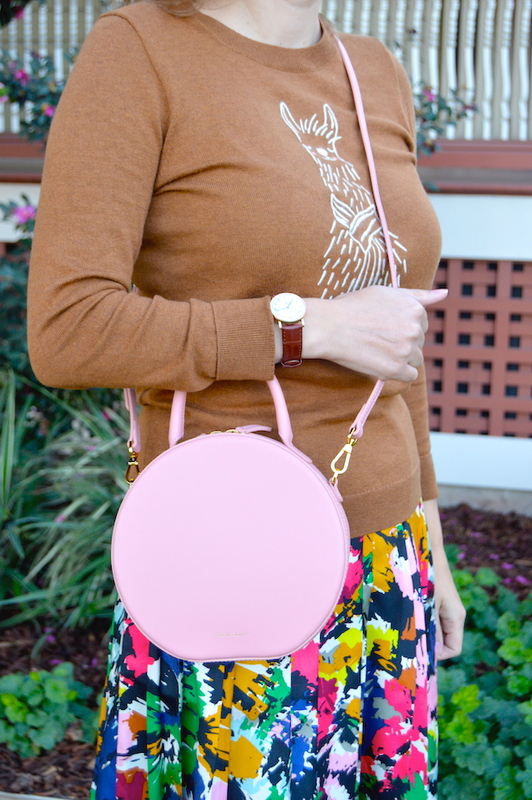 The first early gift is this Mansur Gavriel circle bag. I really, really wanted a light pink bag, so this one is perfect! 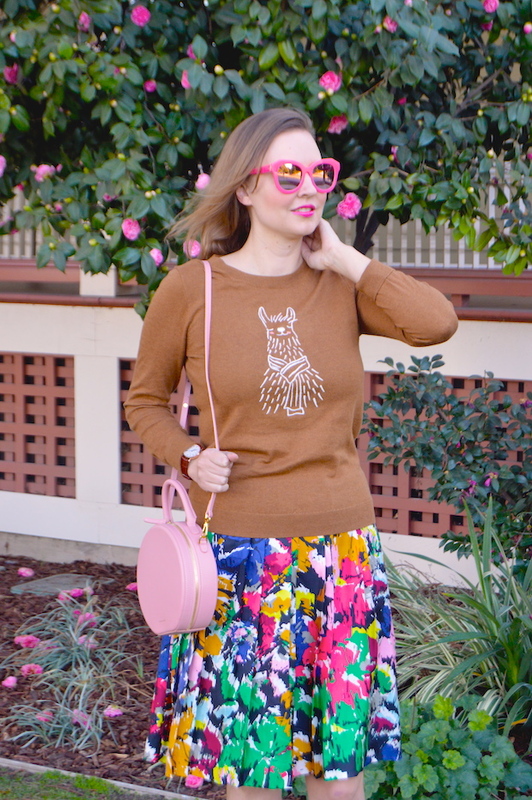 I also really, really wanted a pair of light pink sunglasses, which are surprisingly hard to find for some reason, so that's why I was delighted to find these pink ones from Alice and Olivia! As you can see, Santa's been really good to me already this Christmas! One last note: these pictures were taken about 10-15 minutes before the huge gusts of the Santa Ana winds suddenly rose up last week in Los Angeles! Even before the winds truly commenced, it was hard to get good shots because it was starting to get rather gusty. This is why I'm holding my hair in most of the pictures! If we had shot the pictures any later, I think both my husband I would have been blown away! Luckily, we did not have any damage from the winds and, more importantly, none of the wild fires are too close, so there's a lot to be thankful for during this holiday season! The llama is so cute. I love it paired with the floral skirt! Great use of color as always! I love your sweater! 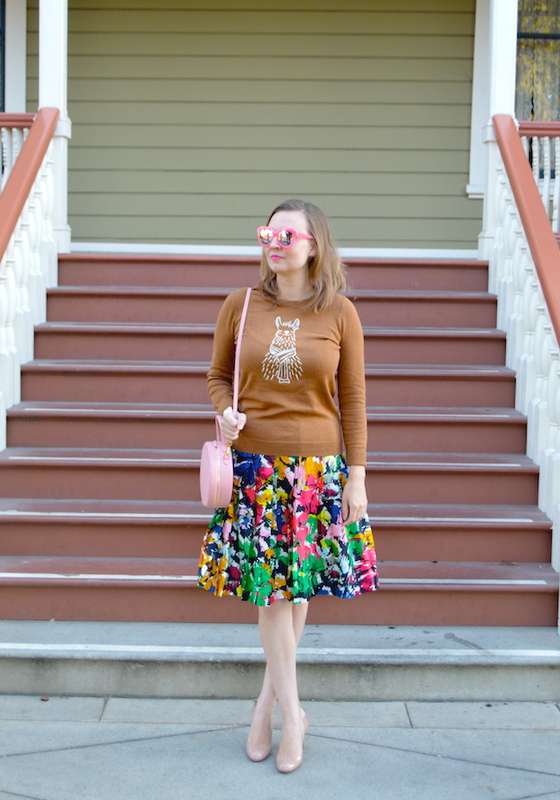 The llama is so cute, and the color pairs so nicely with your skirt. This is such a good look for the winter. 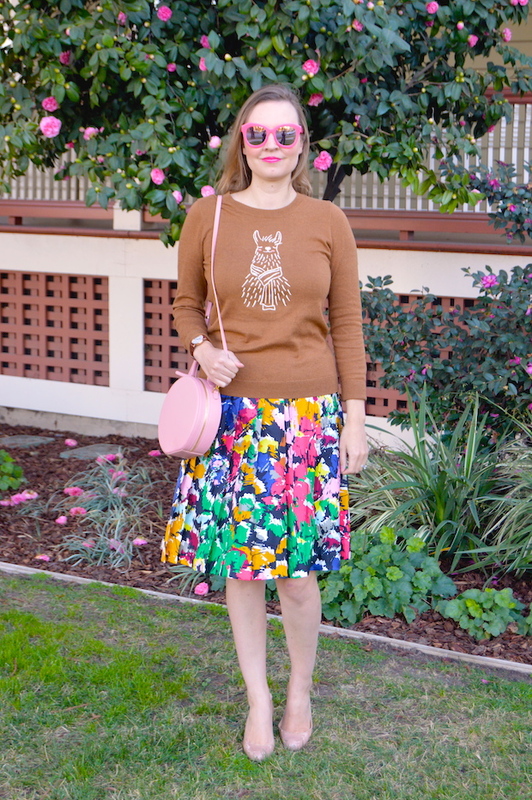 Love the fun sweater with the colors of all the skirt! i keep eyeing the circle bags too! LOve the pink.